Though not without a mawkish quality, this atypical work by the French painter James Tissot bespeaks an essential sincerity. The identity of the father clinging so morosely to his child is not known. They may simply have been models. The setting, however, can be identified as the garden of Tissot's London residence in St John's Wood, a property that later passed to his colleague, the 'olympian' painter Alma-Tadema. 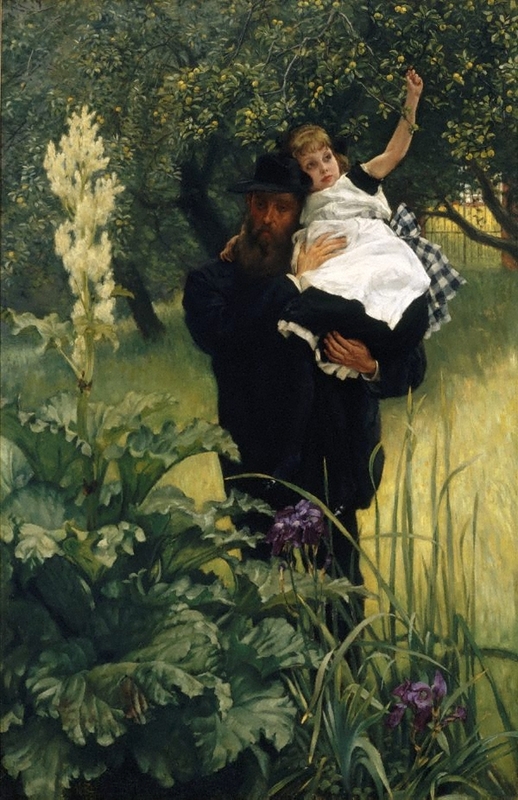 'The widower' has the moralising overtones of a Victorian problem picture, and it may be to the English taste for such images that Tissot was deliberately appealing. His liaison with a divorcee - a woman he frequently painted and clearly adored - placed him beyond the pale of conventional society, and beyond its patronage. It is almost tempting to see Tissot himself as the widower of the title, a man unhappily denied his mate. Technically, the work is an exercise in painterly probity: Tissot's rendering of vegetation, fabric and flesh is impressive. Signed and dated l.l., brown oil "JJ Tissot 1876".